WHAT a paradox! We hope and dream that our children will enjoy a life free from want, a life of abundance and peace. Yet, in many parts of the world we see children, often smaller than the weapons they are carrying, being drilled in the art of revolution, counterrevolution and war. Forced to lay aside the innocence of childhood, they are immersed in a sea of adult hatreds to learn to kill or be killed for causes they don't fully understand, in a world increasingly hostile to their very existence. Why this paradox? Why do adults dream and hope for peace, yet practice the, arts of war? Thousands of children around the world have been pressed into military and paramilitary organizations to fill real or imagined manpower shortages. Many volunteer in, a euphoric state of patriotism. Others succumb to peer pressure or out' right coercion. The death-dealing instruments in their hands suddenly make them a force to be reckoned with. And the heroic fantasies of youth are easily exploited by those who claim to be fighting for the benefit of future generations. The teachable qualities of youths make them desired as the most malleable of soldier material. They become willing to carry out even the most dangerous or repulsive commands. They are often less fearful, not having known enough of life to fear death. For many of these children, the future is a fatal bullet, a deadly bomb or a life shattered by a landmine. According to one estimate, Iran has mobilized about 60,000 Baseej, or boy soldiers, under the draft age of 18. Some of the young Islamic warriors are only 10 years old. According to the Ayatollah Khomeini: "They run away from their parents to become martyrs. And parents take pride in having their children martyred. Even parents with five martyred children regret that they don't have any more to send to the front." 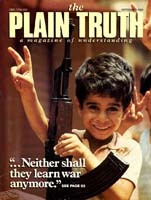 These young Iranian boys-the very future of that nation-are given rudimentary training and much indoctrination, then sent to the Iraqi front• where they perish by the hundreds, hurling themselves at Iraqi fortifications, tanks and minefields to clear the way for adult soldiers who are more "valuable" for the war effort. In Northern Ireland, the situation is different. There are no massive fronts, but the battlelines have been drawn and children are victimized by the rage of their elders. The conditioned-response hatreds of the home spill over into the streets as youths periodically become involved in street violence against opposing religious or political factions or security forces. In spite of the known dangers of confronting security forces in Belfast and elsewhere, children are at times placed in the front of funeral processions and protest demonstrations. In Pol Pot's Cambodia, youthful communist Khmer Rouge soldiers committed atrocities on children and adults alike. In El Salvador, scores of youths fight in the ranks of antigovernment forces. The hit-and-run style warfare conducted by the guerrillas has made them a formidable military force in certain areas of that strife-torn land. Throughout Africa as well, youthful recruits fill the ranks of various antigovernment armies of liberation. The use of children in warfare is not new, of course. Allied soldiers in the Second World War faced hundreds of German youths on both fronts as a desperate Nazi empire was crumbling. Further back, in the history of Catholic Europe, is the incredibly tragic Children's Crusade that took place in A.D. 1212. Two teenage boys, one in France, one in Germany, raised up two armies of youths to reconquer the Holy Land. They believed that a lack of virtue in the adult crusaders was the cause of previous failures. The German group got no farther than Genoa, Italy. The ill-fated French group wound up being sold into slavery in Egypt by unscrupulous merchants who had promised them passage to Palestine. The tragedies, past and present, of youths robbed of their childhood make a mockery of the purpose of childhood and of human existence. Humanity need look no further to discover the cause of today's wretched condition than this revelation: "Their mouth is full of curses and bitterness. Their feet are swift to shed blood, in their paths are ruin and misery, and the way of peace they do not know" (Rom. 3:14-17, Revised Standard Version). They have never been taught how to live the way of peace with their neighbors. Training children for revolution and war is not what God had in mind when he created humans to go through the experience of childhood. Happily, the society God is soon going to bring to this planet is one full of instruction in peace and joy. "All your children shall be taught by the Lord, and great shall be the peace of your children. In righteousness you shall be established; you shall be far from oppression, for you shall not fear; and from terror, for it shall not come near you" (Isa. 54: 13-14, Revised Authorized Version). Only when God's government is restored and enforced on earth will humanity at last be able to "beat their swords into plowshares, and their spears into pruning hooks." And "nation shall not lift up sword against nation, neither shall they learn war anymore" (Isa. 2:4, RAV). Only then, when revolutions, counterrevolutions and wars are banished, will the hopes and dreams humanity has for its children begin to come true.